DU mulls over all India Entrance Exams, replacing cutoff lists. Delhi University plans to scrap off the cut-off system to introduce entrance test for admissions into undergraduate courses, beginning from the session 2017-18. In addition to being aimed by students for its reputation and extra-curricular engagement, Delhi University is famous throughout India and perhaps the world for its soaring high cut-offs. Every admission cycle in the varsity presents an inadequate amalgamation of qualified students in excess numbers and limited seats in over eighty colleges; thus pushing the course cut-offs to new heights, and making it difficult for the brightest minds to secure admission in leading colleges. From the academic session 2017-18, the varsity is reportedly planning to bring forward a new admission process by conducting entrance tests for undergraduate courses, thus doing away with the cut-off lists. Every year, the admission process involves releasing a series of cut-offs for a majority of courses, and students who meet the criteria can then proceed to the college of their choice along with the stipulated documents. Entrance examinations were only being conducted for professional (DUJAT) and post-graduate courses until now. There have been speculations regarding the commencing of entrance exams for B.Com and B.A. programme courses from this admission cycle onwards. Khalsa College’s Professor Nachiketa Singh, a member of DU’s academic council, speaking to a national daily said, “Delhi University is planning to scrap the cut-off list system and move to an entrance test for admissions in undergraduate courses from the academic session 2017-18. The test would be objective. 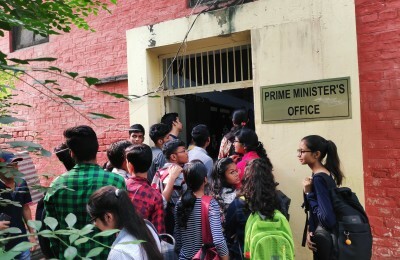 The entrance test is likely to be of 80 marks and 20 marks would be kept for assessing the CBSE marks of the particular subject in which the student will appear for the test.” The varsity’s Vice Chancellor Yogesh Tyagi last year commented on the inflation of marks by boards to secure admission in DU as a major hindrance and remarked that a proposal to introduce a single entrance for all colleges is being considered as a solution. While such a move would come as a breath of fresh air for the plethora of applicants who apply every year, it might also pose difficulties at the functional level. Firstly, after having appeared for the extremely daunting Board examinations, to sit for a singular entrance test which would minimise the importance of the former examinations would leave students with high marks disconcerted. Secondly, while previously aspirants could apply for several courses, such an examination would limit their options if the entrance examination dates were to clash. Moreover, the conduction of such exams all across the country would require extensive planning and work, and it would take time to develop a proper structure.